Soltek's SL-85DR2 is probably the best looking motherboard of the bunch as it uses TripleX's silver PCB to wrangle in EMI, and supposedly help the components to run cooler then on other boards. Whether that's true or not I don't know, but it does look pretty awesome. Based on the i845E chipset, the SL-85DR2 is a no frills motherboard that performed as we expected it to. When I said the board is "no frills" that's exactly what I meant. The only on board feature the motherboard has is 5.1 audio (software codec)! Soltek knows that not everyone needs all the extra stuff that comes with motherboards these days, if you want IDE RAID or LAN Soltek does have models of the SL-85DR2 that have those options as well. Still, if you find yourself needing to upgrade the motherboard with six PCI slots it's not hard. Like most, Abit motherboards the Soltek uses a small sized PCB. Soltek use a modified version of the Award BIOS system that looks a lot better, and is a bit more organized then earlier versions. Soltek have their "RedStorm Overclocking Tech" option in the BIOS, but during testing we found it didn't work very well. In terms of overclocking, CPU Vcore goes up to 1.85V and FSB goes from 100-200 MHz. It was a bit annoying not being able to enter the FSB we want, but instead having to scroll through the entire list... There are also memory and AGP voltage adjustments, but they require a bit of jumper movement which can be a hassle when the board is installed already in a case. I didn't particularly like the arrangement of the power connectors because the main ATX and P4 power connectors are positioned too close together so it's difficult to plug one in if the other slot is occupied. 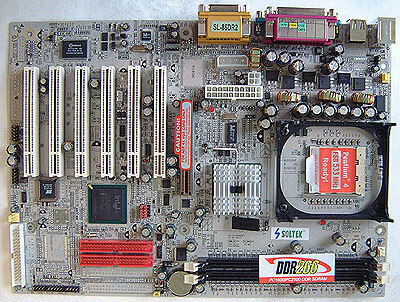 If you're in the market for an inexpensive Pentium 4 motherboard, the Soltek SL-85DR2 is a good option. It quite speedy and it just looks so darn good!